Tuesday From Light is Stockhausen's "war" opera, especially since the second Act features mobile brass and electronics performers roaming around the audience space (and "shooting at each other"). The orchestra is replaced by a 3D electronic soundscape where bombs and planes can be heard exploding and crashing over the audience's heads. For the first Act, Stockhausen composed an idiomatic piece for a traditional Japanese Gagaku orchestra, and then used Western concert instruments to try and reproduce this ancient form. Below is a link to a new synopsis I put together for the Stockhausen blog. Returning briefly to an earlier discussion about the order of the days in LICHT, there was a time when I actually favoured the idea of it all starting with DIENSTAG - initially because its first Act was really the first part of LICHT to be composed and, in some ways, the conceptual seed of the whole cycle, even though, of course, the second Act came much later. I also somehow liked the idea of everything stemming from conflict, rather like the notion of life emerging from chaos as represented in many creation stories. Although it is Michael and Lucifer's day, Eve's place is also marked out right at the beginning, in the GRUSS, where she calls for peace. Anyway - that was a thought I had at one stage, but now just see it as one of many ways of thinking about the 'narrative' of LICHT. It is interesting to think what sort of role new lighting technologies could play in the staging of INVASION-EXPLOSION. I personally think it would be a mistake to go too far, and turn it into a huge light show that ends up overwhelming the music which is already so massively powerful. I think this has sometimes happened in some performances of some of Stockhausen's electronic works in particular, where there have been attempts by lighting designers to add rather too much to what is already there musically. And for entirely different reasons, please no strobing!! The capacity of strobes to mimic and then bring on migraines for me (and epilepsy for some others) makes me sometimes wish they were illegal. I very strongly want to support Ian's thesis: Not so much lighting technology accompanying the electronic music of LICHT - and his hint, that OKTOPHONIE in itself is overwhelmingly powerful. What comes to my mind regarding this theme is the experience of WEDNESDAY in Birmingham. Graham Vick did very well, that he did not perform the GREETING in the background of the public arriving, but as a first scene, demanding full attention. The electronic music of the GREETING took place in a huge factory hall in total darkness, but then obviously Vick lost courage and every now and then added some scenes with dancers in full light - you were distracted from the music, because you thought, you might miss something essential, when you did not look to the dancing scenes. But by this show the music totally lost its power. I was fortunate to attend two times the production; in the second night I closed my eyes and then the experience was overwhelming. Therefore: Not too many scenic effects, and especially nothing that does not come from the music - but from a doubt, the music might not be sufficient in itself. I was even more fortunate than Thomas, in that I attended the dress rehearsal and all four public performances of WEDNESDAY in Birmingham. However, I was not quite so smart, and endured the extraneous mimes for three of those performances before it finally occurred to me that, if I closed my eyes, I didn't have to see them. I heartily agree that any attempt to make visible the sound movements in OKTOPHONIE would be improper. Stockhausen's concept of an invisible dimension which can only be detected by hearing is an integral part, not only of LICHT, but also of many other of his compositions (I am especially thinking of the hidden wind instruments in TRANS). When Stockhausen wants a visual element to make its effect, he prescribes it as such: the mimes in INORI, for example, or (again) in TRANS, with the violet light and the "screen" of string instruments. Should the shuttle-loom there be made visible? Unthinkable! So why the sound-bombs and anti-aircraft fire in INVASION-EXPLOSION mit ABSCHIED? Well I think I have to concede something to Ed on this issue - there is certainly a lot more detail there in the stage directions than I had remembered (which is a little embarrassing, considering that I am studying LICHT so much right now). I guess I was thinking more of some of the lighting effects that were added to a performance of OKTOPHONIE back in 2013 in New York (so therefore not a staging of INVASION-EXPLOSION), and more recently to COSMIC PULSES in the UK, where lighting designers created effects that seemed perhaps to be more about them needing to assert their own art rather than present Stockhausen's. The two should not be mutually exclusive (as was very clear in the discussions that Uwe Wand and Johannes Conen led at the courses last year), but they often are when designers work outside a deep understanding of the music. I agree with Jerry and Thomas about the additions of mimes to MITTWOCHs GRUSS in Birmingham, which I have only seen on DVD. But I wonder how I would have reacted to seeing the movement of search lights and planes in a production of INVASION-EXPLOSION had I not known that Stockhausen had written it into the stage directions? I'm not sure what the answer to that would be - but for me the main point is when design and stage directions interfere with the music and attempt to upstage it rather than express it. This of course was precisely the criticism many had of the Basel production of DONNERSTAG, a criticism I can understand even though I saw that production as more consistent with the music than many others did. As Uwe Wand and Johannes Conen said - they would often do things in their production that Stockhausen did not ask for, but later accepted. So it's not about whether or not to do these things, but how to do them. I guess I return to my original point - a caution about taking these things too far and making them more about the design than about the music. So, while Stockhausen did ask for rather detailed lighting effects in INVASION-EXPLOSION, I guess we just have to be careful not to hope for something that would in fact become a light show with a musical background. I, too, had forgotten about the "light tracers" of the anti-aircraft fire. A stage director would probably find this a difficult effect to produce, because of the way the spatialisation of the sounds is achieved. I have had the opportunity on several occasions at the Kürten courses to change my place in the hall during different run-throughs of Oktophonie, and I can tell you that the "target locations" where those sound-salvos hit change with the location of the listener, because they depend on the relative strengths of sounds coming from different speakers in the octophonic array.. Even if it were possible for a lighting wizard to position those tracers in three dimensions, it would have to be done in some way to parallel this audio illusion. Perhaps Stockhausen's idea here is a little utopian. I am no expert in video effects, however, so perhaps this could be done, but it does seem like a fantastic challenge to me. Yes ... it's a pity Johannes Conen and Uwe Wand are not engaged in this stream - it would be interesting to know if this aspect of the staging was ever contemplated or discussed with Stockhausen in Leipzig. I looked back over my notes from their presentations in Kürten last year, but couldn't find any reference to this. Can you remember if they discussed it at all Jerry? I remember some discussion about the overhead plane, but can't quite remember what it was. I am fairly certain that these "light tracers" were not mentioned at all in those presentations, though they must have come up at least in preliminary discussions with Stockhausen. Few if any of Stockhausen's scenic descriptions have been followed down to the last detail, and much of the time I think he could see for himself how particular stage conditions made certain details impossible to realise. The magician's "magic box" effects that he conceived for Lucifer's Dream springs immediately to mind. The Palasport in Milan is a huge sports arena, and without an enclosed stage area, there is no way to set up the mirrors on which such effects depend. Similarly in the last scene of Saturday, the intention of moving from the Teatro alla Scala to a nearby church was scratched when the management pointed out that this scene would be performed at close to 11 o'oclock at night, and the ruckus of smashing coconuts on the porch would disturb the sleep of people in the neighbourhood, not to mention possible outrage at the idea of using a church for such diabolical goings-on. So the whole production was moved to the Palasport and the church atmosphere was simulated with rows of (truncated) pillars along each side. 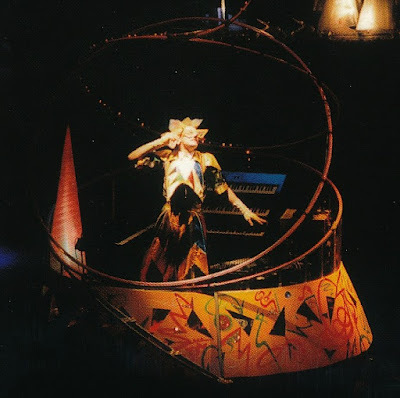 Even though this was only a stage set, it still came closer to Stockhausen's vision than the other scenes did. Stockhausen's description for the opening scene of Monday is perhaps the most poetic and beautiful of all the ones he wrote, but it is hard to imagine how the entire stage front could be covered with a functioning louvre window and, if it could be done, what an open invitation to mechanical failure it would be! I guess there are two sets of issues here - one, those situations you have described, Jerry, where stage directions simply turned out to be impractical and, two, where stage directions turned out to not work as well, or to be as compatible with the music, as Stockhausen might have imagined when he wrote them. I wonder which category, if either, the lighting effects for INVASION-EXPLOSION might fall into. It doesn't seem that it would be all that difficult to have lighting effects following the paths of search-lights, even throughout the space of the auditorium - even in Stockhausen's day, people were doing comparable things in theatres (I remember seeing Werner Herzog's Lohengrin at Bayreuth in 1990 where laser beams were spread across the auditorium roof) - and yet it still did not happen in Leipzig. By a striking coincidence, my Facebook 'memories' feature took me back to this day last year, which was the actual day when Uwe Wand and Johannes Conen gave their presentation on their staging of DIENSTAG. I noted there, in response to someone asking me about the photos I had posted of the set miniatures that were on display in the seminar room, that the huge bird-plane suspended above the auditorium was meant to represent both war and peace together - but, alas, no mention of searchlights. I share your scepticism about a reliably functional louvered blind spanning the stage for the first Act of MONTAG, Jerry. My own blinds have fallen apart completely, and they only had to cope with my front window.